Wanting to give up can be a common issue if you are a human being. If you have gone through a divorce like most of us, it can be an even more common issue. There may not be much we can do to prevent this type of thought entering into our mind, but the more important thing is what we do with that thought. Do we continue to dwell on it, do we look to take some action to propel us toward giving up, or do we accept it as a natural or normal part of life but at the same time take actions to repel away from this thought. Let’s talk more about this issue. Let’s start by talking about famous people who were presented with events that most people would understand if they wanted to give up but they did not. The author of the Harry Potter series, JK Rowling was turned down by 12 publishers. As of this recording, over half a billion books have been sold. Between 1878 and 1880, Thomas Edison and his team tested well over 3,000 designs for lightbulbs before landing on one that worked. Henry Ford failed twice at developing an automotive company and even went bankrupt losing investors money probably the equivalent of millions of dollars today. Somehow the third was a charm and the start of the Ford Motor Company. Imagine had these people given up on their dreams. You have had moments I am sure where you have tried and tried to make the new marriage work. You have tried to enter into parenting the stepkids. You have tried to be united with your spouse regarding how to parent all the kids. You have tried to be friendly with your ex-spouse. You have tried to be friendly with your spouse’s ex-spouse. You have tried to make the relationship with your new spouse’s parents family. Maybe one or more of these areas aren’t working. So it is no wonder you may have had feelings of wanting to give up. 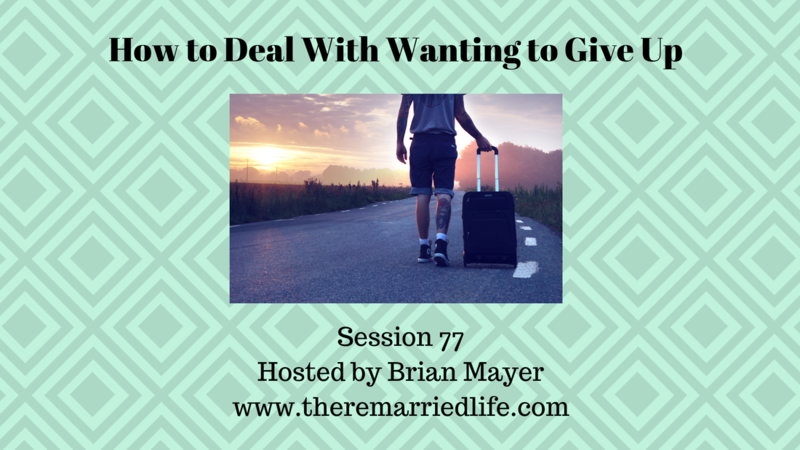 Let’s explore why feelings of wanting to give up especially for us who have dealt with this issue in the past. One or both of you in your past relationship made the decision to give up. Since it happened once before, it sort of broke the ice on this subject maybe in a bad way to open you up to the idea of it. You made it through the recovery from giving up on a past relationship. In other words as painful as it was you came out on the other end and realize that if you got through it once you can get through it again. The kids not blending and not listened to you as an authority figure can certainly lead to feeling of wanting to give up. You thought you chose your new partner with more of your head than your heart, but different issues have arisen and it becomes maybe even more perplexing than the end of your first marriage. Now that we have talked about reasons that giving up thoughts might happen, lets talk about ways to work to lessen the power this may have over you. Work to compartmentalize the issues as best you can. This means dealing with each issue as it comes and to not let things pile up. Work on the concept of forgiveness. This means offering and accepting forgiveness often. Practice this with each other and with the kids. Weigh out the positives against the negatives. Often we get flooded with all that we see that is negative that we forget about what is positive. If thoughts of wanting to give up come in the immediate aftermath of a conflict, work to calm yourself down and see if the thoughts continue. Often they will not. Discuss with your spouse these thoughts and ask if your spouse has these as well. Chances are good that you probably have had these. Of course coming at this from a place of wanting to work on things in spite of the thoughts can help.